Researchers from the University of Queensland have revealed new information about key proteins involved in trafficking proteins between different parts of the cell. 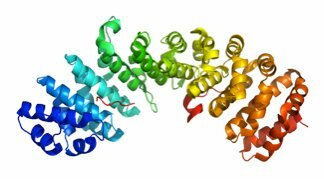 One of their proteins is the 500th protein structure revealed at the Australian Synchrotron and registered with the Protein Data Bank (PDB). PDB is a central repository that makes information about protein structures available to researchers all around the world. In cells that have cell membranes, such as ours, the nucleus is surrounded by a membrane that separates some cellular activities from others, including processes involved in copying genetic material (DNA, deoxyribonucleic acid). This means that the controlled movement of proteins and ribonucleic acid (RNA) between the nucleus and the rest of the cell (the cytoplasm) is absolutely essential. The movement of proteins and other molecules between the nucleus and the cytoplasm is enabled and controlled by ‘transport factors’ called importin-alpha and importin-beta. Importin-alpha recognises ‘targeting signals’ carried by proteins destined for the nucleus, and alerts importin-beta to get ready to transport the proteins into the nucleus. Australian researchers used the powerful capabilities of the macromolecular crystallography beamlines at the Australian Synchrotron to investigate the fine detail of some unusual targeting signals in mice. Their findings will help researchers better understand the diversity of targeting signals and identify new proteins containing non-classical targeting signals. Want to know more about PDB? In eukaryotic cells, the nucleus separates a number of cellular activities, such as transcription, from others, such as translation. Trafficking of proteins and RNA between the cytoplasm and the nucleus is therefore a key cellular process. Proteins destined for the nucleus usually contain a short targeting signal called the nuclear localisation signal (NLS), which is recognised by the transport factor importin-alpha. Importin-alpha acts as an adaptor and requires its binding partner importin-beta to be able to carry the cargo through the nuclear pore complex into the nucleus. A number of other proteins, including the small GTPase Ran, regulate this nuclear import process and ensure its directionality and efficiency. The NLS motifs can have quite diverse sequences. They can have one or two clusters of positively charged amino acids, which can bind to two sites in importin-alpha, the major and minor sites. Recently, a group of minor site-specific NLSs has been identified. In the structure of mouse importin-alpha in complex with the NLS from mouse RNA helicase II/Gua (PDB ID 3ZIN), the structural basis of specificity of this particular minor site-specific NLS has been characterised. It was found that the reason for this NLS binding specifically to the minor site is that it forms an alpha-helical turn at its C-terminus, which is distinct from all other importin-alpha:NLS structures reported to date, which feature the NLSs in an extended conformation. The helical turn prevents the NLS from binding to the major NLS-binding site. The structure helps us understand the diversity of NLS sequences and can aid in identifying new proteins containing non-classical NLSs.